I love peonies too. When we bought this property, the previous owners had already planted several pink and white peonies. They are just ready to burst into blossom; I check them every day! 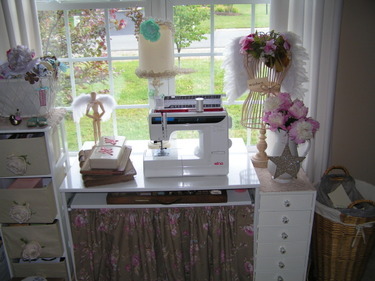 Lovely little sewing area, I would love to have one set up in front of a window. Beautiful flowers! I love them too. Your purse was so cute, too bad the company is no longer in business. I have been enjoying your beautiful blog for a few weeks now and wanted to say hello from Minnesota. I am also in love with peonies and have 2 plants myself. They are currently tight buds and I am waited with baited breath for them to open. Thanks for sharing the sight to look and order more! 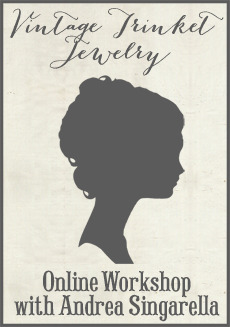 And thank you for all of the beautiful inspiration you share with all on your site! I love Peonies too. There are supposed to be a few varities that can be grown here in Texas, but I think most cannot. I did get to see some in Illinois once and they were just fabulous. Is it true that they need ants to bloom? Andrea, they are simply beautiful and one of my all time favorites too! My husband did the exact same thing with my peonies...and my hydrangeas..and my sweet fox glove...you get the picture? I love your sewing area! I am going to have to go back through your blog to see if you have posted more pictures of your work area! Just lovely! I too love peonies and they are one of my favorite flowers. Lucky girl to have some fresh from your garden. OH mannnnnn, so gorgeous!! I want some now! Oh peonies are my favorite flower too! Why is it that all the most beautiful things are so fleeting?? Like Bridal Wreath Spirea.....so we won't take them for granted I suppose. Me too, me too!!! LOOOOOVE peonies. So fluffy and fabulous. Beautiful pics Andrea. Just beautiful. Peonies are also my favorite flower. I just adore them! I've been watching mine and they're about to bloom. I can't wait!!! 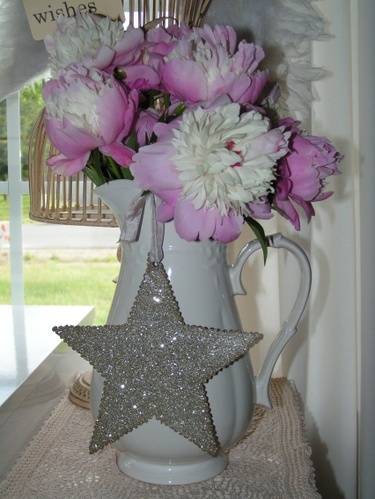 Pretty peonies! What a neat thing to have inherited them over generations! That peony website is just sinful!!! Thanks so much for the link! Love the history behind yours! My great aunt, Martha Stewart for Kmart gifted me with mine! Ha ha!!! Concerning a post above, love Marie Claire Ideas also!! Love peonies,and am the happy gardener of 10!!! about 5-6 types. Do you know the name of yours that is in the photo? they are gorgeous. It seems that the older specimens are even more beautiful than "modern" varieties. I never knew what a peony was till my MIL brought a bouquet to my wedding. The scent was intoxicating. 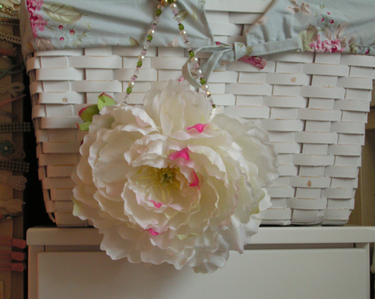 I had to have the lovely peony flowers in my yard~ and I do~ 6 of them. I love peonies the very best~ then roses. Thank you for sharing yours.